Food bloggers across the world will be joining together to raise funds for the hungry again this year. Last year food bloggers and their readers raised more than $60,000 for the United Nation's World Food Programme. This year we aim to do it again with your assistance and support. To learn more about the UN World Food Programme and Menu for Hope's involvement, please click here. This year all the funds raised by the event the funds raised by Menu for Hope 4 will be earmarked for the school lunch program in Lesotho, Africa. Menu for Hope raises money by "raffling off" prizes donated by bloggers. Each $10 donation entitles you to a chance on the prize of your choice. Here is what eventually be a full listing of the prizes from event coordinator and originator Chez Pim. The West Coast prize coordinator is Rasa Malaysia. That site will have a full listing of goodies from West Coast bloggers and is a good source to check on the in-person classes, tours and meetings some bloggers are offering. Here's Bee's post with all the info. 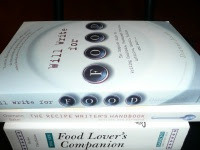 Blog Appetit is donating three books I'm calling "The 'I Wanna Be a Food Writer' Package." It is Will Write for Food by Dianne Jacob, The Recipe Writer's Handbook by Ostmann and Baker, and The New Food Lover's Companion by Herbst. These three books will help give you the skills, passion and even some facts to help you really get your food writing career cooking. It's a great package for food bloggers, too. The prize code for this package is UW33. 1. Choose my prize or one of the many prizes from Pim's Menu for Hope prize post. Take note of the prize number(s) you are interested in. 2. Go to the donation site at Firstgiving and make a donation. 3. Please specify which prize you'd like in the 'Personal Message' section in the donation form when confirming your donation. You must write-in how many tickets per prize, and please use the prize code. Each $10 you donate will give you one raffle ticket toward a prize of your choice. For example, a donation of $50 can be 2 tickets for UW33 and 3 tickets for EU02. Please write 2xUW33, 3xEU02. 4. If your company matches your charity donation, please check the box and fill in the information so we can claim the corporate match. 5. Please check the box to allow us to see your email address so that we can contact you in case you win. Your email address will not be shared with anyone. You can donate beginning today until December 21. Check back on Chez Pim on Wednesday, January 9 for the results of the virtual raffle. Watch for this post to be updated and for future posts about about some of the prizes and other details. nice one. really nice and usefull post. A Note About "Not Secure"
However, please note that this blog is still perfectly safe with no third-party software or ads that could be problematic and no blog-specific signups. Hosting, RSS and commenting is handled by the mighty Google for Blogger and are protected by Google's very secure system. Please use the above Google custom search box as well as the Blogger search function at the top of the blog. Using both will more likely help you locate the posts you need. Or check the categories below. The San Francisco Food Bank did not hold its Hunger Challenge in 2012, but you can see the Hunger Challenge 2011 posts here and 2010 posts, budget recipes and other information here. Click here to see what I've written on that including recipes and tips for eating on a budget as part of the 2009 Hunger Challenge. I also participated in and wrote about the 2008 challenge here. Want more info on what to do, see and eat in San Francisco and the Bay area? Check out Blog Appetit Does San Francisco. Click here to check out other websites and blogs you might savor. 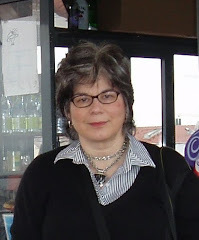 Click here to see a list of my publications and prizes. I'm Back, Did You Miss Me? Bravenet Counter -- Tracks Visitors to Blog Appetit Since January 3, 2006. Thanks for stopping by. You all come back now. Simple theme. Theme images by kcline. Powered by Blogger.